The German PPI gained 0.2% in June on the heels of a 0.6% rise in May. The headline PPI excluding construction is on an accelerating path, rising at an excessive 3% pace over 12 months, held at at 2.9% over six months and stepping up to 4.6% over three months. While price targeting in Germany and the EMU tends to focus on headline inflation, the ex-energy PPI is quite stable just below 2% as it expands at a 1.9% pace over 12 months as well as over three months annualized, and it is only a ‘tick’ higher over six months. We use these inflation benchmarks to gauge inflation in Germany but also to compare it to the ECB’s goals. Of course, the ECB targets EMU-wide inflation not any rate at the national level and its target is the HICP, a consumer prices index, which is supposed to expand at a pace just below 2%. German CPI inflation tailed off in June rising by only 0.1%, but not enough of a drop off to compensate for the 0.5% rise a month earlier. That month alone took up one quarter of the 12-month allotment for prices to rise. As a result, the German CPI is accelerating from 2.2% over 12 months to 2.4% over six months to 3.3% over three months. Since the ECB makes monetary policy for the EMU, there is nothing that the Bundesbank can do about this. However, on a more conciliatory note, ex-energy CPI inflation is up by only 0.1% in Germany in June. And while that also is too little of a deceleration following a 0.4% gain in May, that rise had followed a flat performance in April. As a result of that string of gains in the ex-energy PPI, Germany’s PPI inflation continues to expand at growth rates below 2% on all horizons. Brent oil prices have been a persistent boost to inflation recently. 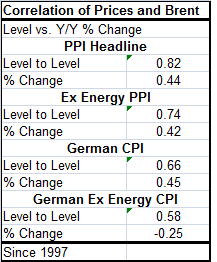 The table shows Brent movements on the same frequencies as the PPI and CPI data for Germany. There we see that while Brent prices fell by 1.5% in June, they had risen by 7.4% in each of the two previous months. Over three months, Brent is up at a 66% annual rate. Over 12 months, it is up at a 59% annual rate. It is also up at a 55% annual rate in the just completed second quarter. Oil prices have been rising strongly and persistently. The table to the left gives some insight into how rising oil prices filter through to PPI and CPI inflation rates in Germany. It is clear from the table that Brent has a correlation to the PPI (0.44), to the ex-energy PPI (0.42) and to the German CPI (0.45), but not much direct relationship to the ex-energy CPI at all (-0.25). We see the impact of those correlations borne out in the top table. There is a lesser impact of these voraciously rising oil prices on ex-energy inflation. While it is not the German predisposition to give core or ex-energy inflation the limelight, with energy prices cooking, taking a less strident position on headline inflation while the core is behaving is only sensible- especially at a time when growth is still struggling. Of course, Germany per se has different circumstances than all of the euro area with the lowest unemployment rate it has had since German reunification. Yet, the Bundesbank has trimmed its outlook for growth. China has slowed. These developments plus the looming threat of trade war provide a sharp counterpoint to an environment in which inflation is rising, spilling over and spreading. Inflation at the moment seems to be a temporary artifact of oil prices that have recovered from some extreme lows. Oil prices have been propped up by an agreement with OPEC and Russia that has recently undergone some change. There is further uncertainty about oil because of the U.S. having scrapped the Iran nuclear deal that for a while has allowed Iranian oil to flow legally to markets. Oil volume from fracking in the U.S. continues to expand and to come on stream. It does not seem likely that oil will be able to repeat its gain of the last year and seems much more likely that oil will now struggle to hold these levels. If that is the case, the underlying inflation rate as measured by ex-energy inflation is much more likely to persist than the pace currently sketched out by headline inflation. No one who is German might be satisfied by this state of affairs, but most of the rest of us will be.